Iran on Sunday voiced opposition to a US-mediated resumption of peace talks between Israel and the Palestinians. “Tehran along with Palestinian groups expresses its opposition to the proposed plan and it's certain that the occupying Zionist regime will utterly not agree to withdraw from the occupied lands,” said foreign ministry spokesman Abbas Araqchi. 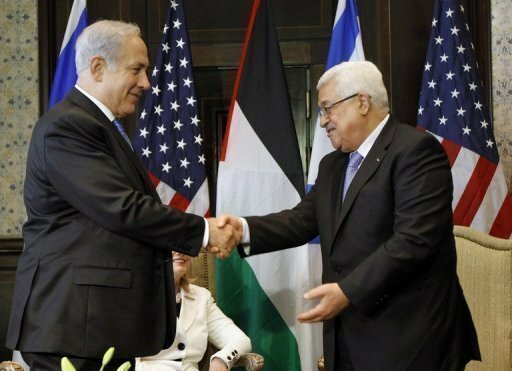 US Secretary of State John Kerry announced on Friday that Israeli and Palestinian negotiators had agreed to meet to prepare a resumption of direct peace talks. These "talks" will never see the light of day as the Zionists continue to usurp land and play charades with the poor Palestinians who have lost everything. It reflects more on US desperation than anything real. Dr. Rohani also alluded to this farce and cast doubts on any hopes for change to Zionist expansionism and opportunism during the Arab chaos. And Iranians should care about this, because? because there is no reason to care about two countries that in fact they have very little in common with Iran. Iran does not have any border with these two. An average man in Iran has never met a palestinian in his life. He may have come across few jews in Iran who are Iranians anyway. THere are more important things to worry without getting involved in these peoples affairs. I don't understand these people who seem to have nothing to do except babble about zionism all the time. Who cares about it anyway. Is it our problem. How much we are going to worry about that wreched desert! "I believe that over the long haul these radical Islamic regimes are going to fail because they don't offer the adequate enfranchisement that you need to develop a country economically, politically and culturally,"
How is life on your delusional planet? Turkey, Egypt, Saudi Arabia, Qatar and most hilarious Afghanistan, Taliban and alCIAda think that "political Islam is dead"! With such moronic joviality you made my day, I am literally ROFLMAO off. Where do you guys get this stuff? I also want to who your supplier for these hallucinogens is because you are on a high all the time obviously, so supply is greater than demand, unusual in these pressing economic times. However, keep the political comedy rolling! dillusionist who cares about others than his/her house. The country is in a mess and he is worried about Palestine. You must be an Arab then! No I`m not,but what would it matter if I was.Your attitude is sadly one of selfishness and ignorance and most likely bigotry and prejudice too judging by your "you must be an arab" remark,its the attitude of "who cares about others so long as I`m okay",someone who cares nothing for anyone apart from themselves.Its not a choice between iran or palestine as you seem to think you can care about what happens in both nations,I suppose someone like you would have thought "who cares about apartheid I`m not black"
Good point, Anon 7:27 PM. If people like them had their way, apartheid would still be the regime in South Africa. Political Islam is the cannibals and foreign, wahabi terrorists that the USA are supporting in Syria to chop off heads and murder minorities. Iran is nothing like them. A 9:32---- Iran is the land where the vile head of state demanded the murder of an author. spew your dishonesty into the mirror. What interesting hypocrisy, ufred. Oppose political Islam when it is against American/zionist interests and provides an opportunity to attack American/zionist enemies, yet, STAY QUIET OR SUPPORT it when it serves American/zionist interests in Libya and Syria. You anti-Iran people must really admire cannibals, head choppers, child killers, rapists and murderers of Christians.